Allagash Guide Service was established in 1980 by Robert and Nancy Condon, starting as just a little business, catering to outdoor recreation. From May 1995- June 2016, Sean and Kelley Lizotte, along with their children, we the second owners of AGS. During their ownership they continued to grow the business, offering more services and hosting a larger number of clients. In June of 2016, Brittany and Brandon Lane, purchased Allagash Guide Service, becoming the third owners. 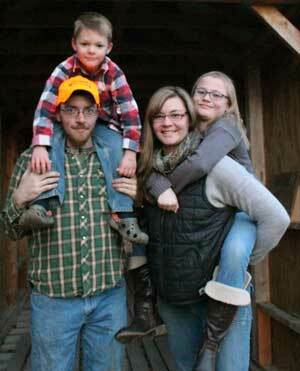 Brandon and Brittany owned and operated a small guiding business in Central Maine for 7 years prior to purchasing AGS. During that time, they realized they wanted to make the outdoor business a way of life and career instead of just a hobby. Along with their two children, Lukas and Emilee, Brandon and Brittany are here to provide you with an outstanding outdoor experience that you will remember for years to come. Allagash Guide Service has been in business for ALMOST 40 years! Although the business has changed ownership three times, we continue to provide quality outdoor experiences, offering year-round lodging, along with hunting, trapping and canoeing trips in the most Northern part of Maine. Our year-round, family friendly business provides lodging for vacations, snowmobiles, ATV’s, hunting or fishing trips and meal plans that have people making memories that they will never forget. Come kick back and experience an abundance of activities that the northern Maine outdoors has to offer. To provide you with the best experience, we are an outfitter that is open year-round, meaning we live in the town of Allagash, 365 days a year. Every season we are doing something out in the North Maine Woods. From canoeing, fishing and working on our hunting sites in the summer, providing hunting trips to sports and doing a little ourselves (when time permits) in the fall for bear, grouse, moose and deer, to hunting coyotes with hounds, looking for moose sheds and snowmobiling in the winter. We are knowledgeable and experienced, yet still learning new tricks about the outdoors every day. As the third owners of AGS, we take our promise in making your trip a success and as memorable as it can be, very seriously. If you are looking for an outdoor adventure, please contact us. We are more than willing to make your dream a reality.